By stayhomecupcake on March 7th, 2013 . Filed under: Artwork, Cupcake Ideas . This has to be one of our favorite sayings here at All Things Cupcake! And now for only about $5, you can wear it on your nails. Fun? Yes! Quirky? Yes, that too! These decals are being sold on Ebay from seller yr_nails_online and they have many, many different designs. 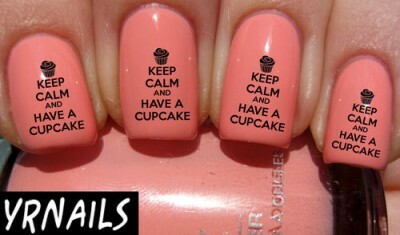 It seems that decal nail art is very much in (sweet) style!